Today is Christmas, It was a wonderful day of exchanging gifts with my wife, playing with new toys, enjoying each other’s company, and basically laying about. One of the gifts Hykel got me this year is an Amazon Echo. 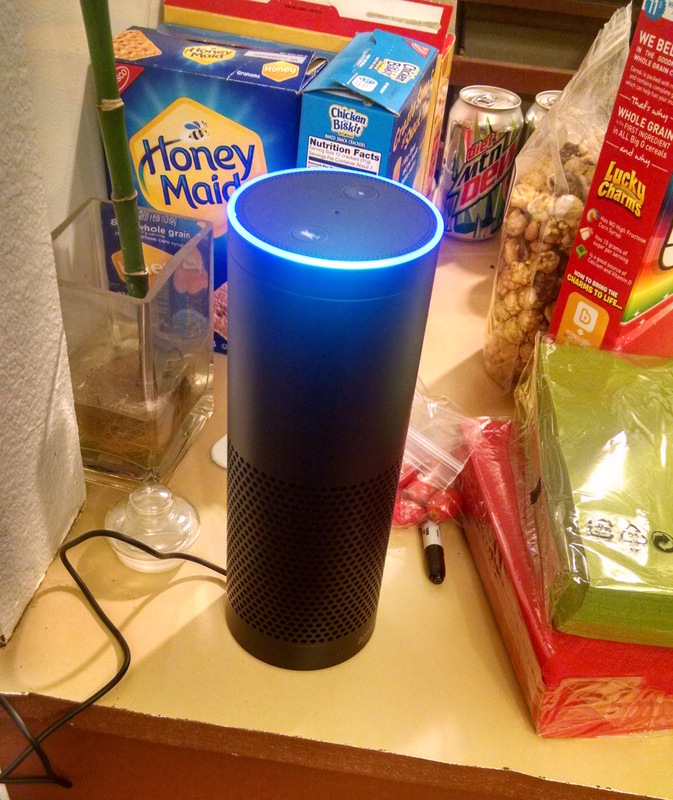 The Amazon Echo is a device voice-command data robot that sits on your counter. So far, it’s the closest thing to Star Trek voice command computer I’ve seen. The concept is simple, and one you’ve probably encountered if you have a modern smartphone: You ask the device to do something, and it responds by accomplishing said task. It’s similar to Siri, or Google Now, or Cortana (Respectively Apple’s, Google’s, and Microsoft’s voice assistants) but it lives in your home rather than on your person. Echo can set a timer, play music, answer trivia questions, convert measurement, and a host of other things you can imagine asking it to do. I’m still building out my particular workflow, but where Echo gets really cool is the ability to build out task sets using IFTTT. IFTTT is ‘If This Then That’, it’s a free service that allows you to automate tasks based on triggers. For instance, you could set up a recipe that automatically saves pictures to Dropbox from Facebook if you’re mentioned in them. Triggers can be any number of things, and more are being added all the time. Echo has a trigger that allows you to add virtually any phrase you want. The phrase looks like “Alex, trigger _________” It’s not quite natural language, but it’s enough that you can use it, and you can use this to do anything you can hook up an IFTTT recipe to. Post on Facebook, Twitter, etc. Email, startup programs on your computer. It can be extended into the hardware world too. Controlling your lights, locking your door, opening and closing your blinds or even opening your windows – that last one especially would require some work on your part, but it’s a future we’re not too far away from, and one that I’m excited to be looking at.